It’s possible that I’ve been going a little salad crazy around here lately. Jack has brought it to my attention that we may have one too many salad recipes on the site. So this week, I’m changing things up: first pasta and now pizza. Because sometimes we all need to live a little and just say yes to a few carbs. So last Sunday night when I announced “pizza night!,” I got a thumbs up from Jack. When I said “it’s gluten free pizza night!!! !” he gave me a look. 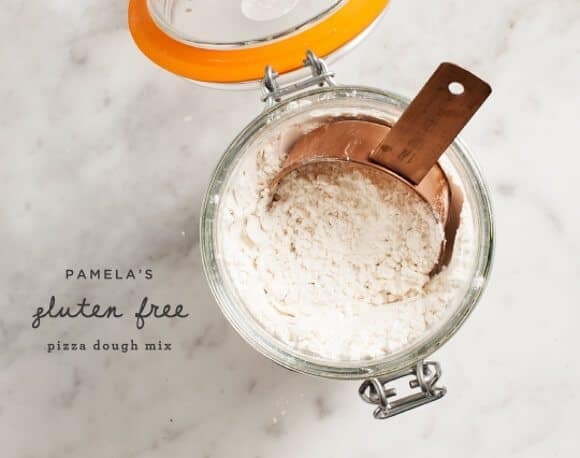 I knew Pamela’s pizza crust would be good (like I mentioned before, all of my gluten friends swear by their flours), but even Jack was surprised how gluten-full it tasted. The dough is very sticky to work with (you won’t be tossing it into the air). We carefully formed it, partially baked it and then grilled it. The edge was crispy, the middle was chewy… you’d never know this crust was made with brown rice and other whole grains. Preheat oven to 475. Mix the pizza dough according to package directions. Use a little cornmeal to help form the dough into (about) 2 10-inch pizzas. Since the dough is sticky, we put it between 2 pieces of parchment and rolled the crusts out with a rolling pin. Partially bake them (on parchment) for 8-10 minutes or until they're cooked in the middle and cohesive enough to lift off in one piece. Brush with olive oil and grill for 1-2 minutes on each side. 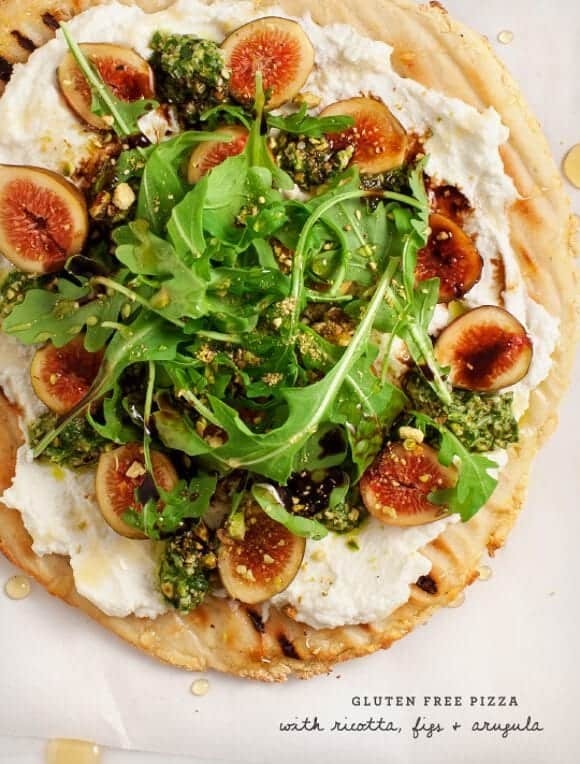 Top grilled flatbreads with ricotta, sliced figs, a few dollops of pesto, arugula, pistachios, honey, and balsamic vinegar (or balsamic reduction). Optional step: make a balsamic reduction by simmering vinegar over low heat in a small saucepan. Stir frequently until it's evaporated into about half the amount you started with. 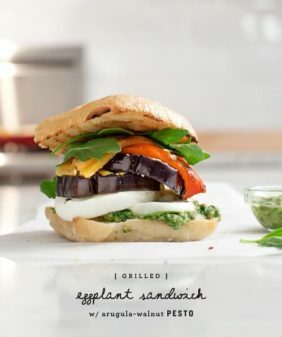 Vegan option: skip the ricotta (and the honey), and spread a layer of pesto instead. that pistachio pesto…yum!!! I have never tried gluten-free pizza before but this dough seems pretty good. pizza is the thing that i miss most being GF and i have yet to find a GF pizza crust i like — i am definitely going to try this! Thank goodness for your blog and all the alternative breads you do. My sister is gluten sensitive and I know her fave food is pizza. This looks so good that I have to make it for her. Thank you for the beautiful recipe. oh dang girl, this is pretty. i am pitching this to nick for friday’s pizza night! Yummy, I love ricotta on pizza, so so good! Yum, ricotta is the best! Mmm….I love pizza. But in such variant I love it even more! ricotta+pesto+figs can make magic! Gosh this pizza looks so delicious. I have never before used figs on pizza. Looking forward to trying this soon!! Oh this looks so tasty! Figs are soo nice, great with a salad and the ricotta. Gonna try this out one day when I’ve friends over! Talk about a dream combination and that GIF – good lord, I am drooling over here!! Oh wow this looks absolutely delicious!! I love figs, and I love pizza. The fact that it’s gluten free make sit perfect! Yum! This looks amazing. We just tried a flatbread that had peaches on it last week – looks like figs are next up! That pizza is insane! Love the salty/sweet combination and the gorgeous colors. I’ll have to try that dough mix as it looks perfectly pillowy and delicious. Thanks! There is no shortage of fabulous gluten free meals on your site. This looks great! Such a gorgeous pizza. 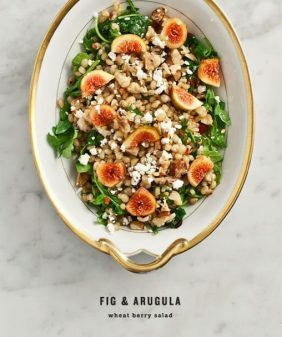 Loving the fresh figs on there! Love the animated gif! And no, I don’t think you can have too many salad recipes. 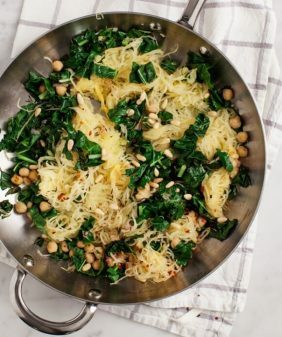 They’re so versatile and lend themselves to adding leftovers like grains, lentils, and beans to make a full meal. But regardless, this flatbread is to die for. I love figs and always try to find special ways to celebrate them. This is perfect! Great looking pizza you got there! I haven’t ever seen Pamela’s products before, but we have Bob’s Red Mill products. Have you tried his pizza crust mix? I’m skeptical…The only Bob’s product I’ve used was an all-purpose flour substitute and well…it was a horrendous mess. Sticky doesn’t even begin to describe the gelatinous mess I faced that night. Do you have any tricks for dealing with EXTRA sticky dough? Thanks!! Wow! Gorgeous! Sounds so good. I live and die for fig season. Hurray! Getting GIFfy wit’ it. I love this post, lady! 🙂 Figs forever and ever! Love it, Figs are rich in calcium. and Figs are known for their soothing and laxative properties, and they are also low in fat and sugar. 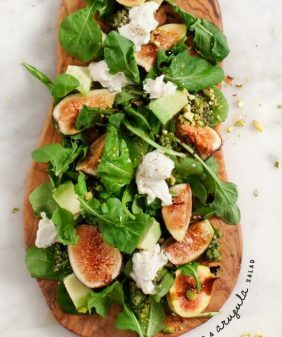 All of these flavors (pesto, pistachios, + figs) sound delicious together! This might only serve one (my fiance) in our house, but hopefully he’ll share some with me! 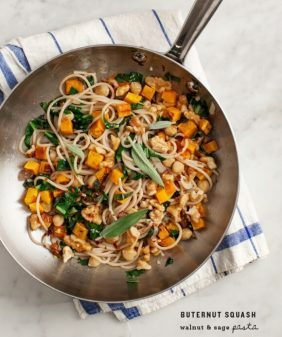 Mmm, I saw this recipe and literally said “UGH YUM” really loudly. My roommate came into my room. She was concerned. Looks amazing! I have never had ricotta on pizza before but that sounds delish! I love this! The flavours harmonise perfectly together! I love arugula on pizzas – a taste I’ve definitely acquired with age. Its spiciness is a great complement to otherwise indulgent foods. 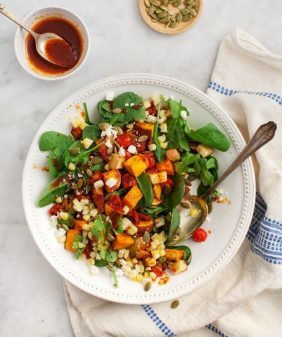 The combination of the toppings is just spot on for me: sweet yet tart and herby (I’m not sure if that’s even a word) and all on a creamy bed of ricotta! Genius! This looks amazing. I recently went gluten free and one of the things I miss the most is pizza. I did try a pizza mix (I think it was Pamela’s) a few months ago and it was surprisingly good. I also wanted to let you know that I love your blog! Everything is so healthy and tasty, and the photos are gorgeous. On Sunday I made a Spanish-themed brunch, and made your ginger-peach sangria (although I made to modify it a bit and use apples and oranges since our peaches weren’t ripe.). It was delicious, and I loved the mint. I also made the gazpacho recipe you listed from a guest blogger (The Yellow Table, I think? ), using heirloom tomatoes from a friend’s garden, and it was also delicious. Thank you! Your blog brightens up my day, and my makes my taste buds sing. This looks insane! Will make this for Friday night! I made this pizza three times in one month and it was so delicious. Thanks for the great recipe. ha, so glad you like it so much! Wow, talk about a creative idea. I never would have thought to put figs on a pizza. Even with the more out of the box creative desert pizzas I never would have experimented like that. Thanks for giving me the confidence to try this idea! Nice blog… I just read your blog and I really appreciate your blog. It is full of resourceful information.Thanks for sharing information..
Or any pizza or flatbread would work well with these toppings. Hope that helps!